If you have any questions about dealing with a potentially corrupted file, call support before you attempt to perform any of these actions. If you experience these situations, you've got network or hardware problems. The errors occur more than four times a year. The errors come and go, without having to rebuild the file. Most of the time, corrupted files can be rebuilt with no loss of data. Often, your first symptom of a corrupted file will be an error message similar to "File error 91, 02 on GACNTL.FIL . . ."
This error message indicates that the file causing the error is "GACNTL.FIL" and this is the file that would need rebuilding. Your error may indicate a different file and that is the file that will need rebuilding. There are two ways to run the rebuild utility. You get there by clicking File > Special > System Information. System Information might take a few seconds to open. 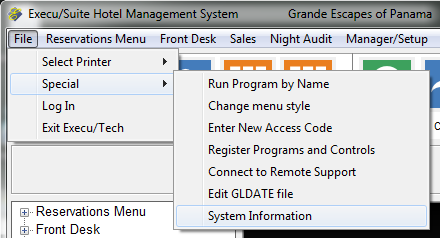 If you don't have the modern drop down menus, use the "88" method to run a program by name. The program name you will enter is "MENUSYSI". You will then see the following window. If this is one of the common core files, you'll find it in the Quick Rebuild drop down box. If you find it there, select it and then click Quick Rebuild. If you don't see the file, click Select File, below and to the left of the Quick Rebuild button. Find the file, ending in ".fil", to rebuild. After the file is located, click the Open button to return to the main System Information window with the file you selected displayed in the box. To rebuild this file, you click the Rebuild File button, located below and to the right of the Select File button. *This can only be done at your server, where the software is installed on a local hard drive. 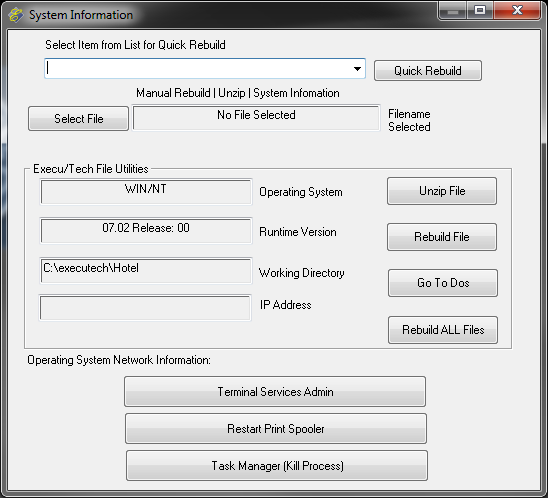 If you don't have access to the System Information utility, you can run the rebuild from the command prompt. Different versions of Windows access the Command Prompt in different ways, so use Google to determine how to access it on your computer. Make sure you have the name of the file that's causing the error. You'll need to change the directory to where the software is installed. In this example, we use the file name "GACNTL.FIL" but the file name in your error message may be different. Use the file name in your error message. In the Command Prompt, type "vutil32 -r GACNTL.FIL" and press the Enter key. After clicking either Quick Rebuild or Rebuild File, you'll see a command window open with the progress and results of your file rebuild. If you receive a response similar to this one telling you how many records were recovered and how many deleted records were removed, then the rebuild was successful. Type a "Y" and press enter to replace the original (corrupted) file with the new (rebuilt) one. There are three typical, although uncommon errors you might see. The first warns you that the chain of records is broken. This means that there is a point in the file where the damage is just too severe to recover. This is rare, but it happens and is usually the result of large chunks of data being removed from the file. When it does happen, you'll find that you usually lost a single record, the last one to be saved when the problem occurred. You will lose all of the lost records and depending on the affected file, these could be reservations, Point if Sale transactions, etc., so it's a good idea to call support and ask for advice. Type an "N" and we will have you rerun this utility if needed. While you're calling us, you should also try to locate your backup because you may need to restore it if the damage is too severe. The second error warns you about records with duplicate keys. This is usually due to network traffic problems and hard drive caching problems. This does what is impossible to do in the software, add records with a duplicate key. Most often, these are the same records created a second time because of a failure in the hard drive caching. It's very rare but it happens, though typically only to a few records. As in the previous case, you should call support. The third error warns, Not a Vision File - Rebuild Stopped". Vision is the file structure used in many of the files and the error can be caused by three reasons. 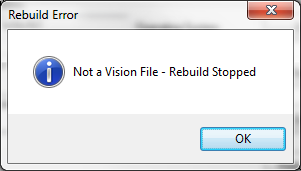 The fist reason is that the file really isn't a Vision File and you may have selected the wrong file to rebuild. The third reason is that the file has been damaged beyond recognition. Locate your backup because you may need to restore this file. If, after restarting your server, the error continues, call support. It may be that you're trying to rebuild a file that doesn't use the Vision File structure, or the file may be damaged beyond all recognition.